Chael Sonnen said plenty of entertaining things throughout his critically acclaimed UFC 117 comedy tour. However, one of the disses he fired off appeared to hit home as middleweight king Anderson Silva entered Oracle Arena with a point to prove. Fellow UFC fighters and Team Black House mates Antonio Rodrigo and Antonio Rogerio Nogueira were hit by unfriendly fire when Sonnen started to question the credentials behind the Brazilian jiu jitsu hardware that was “given” to Silva by his amigos. “He’s got a black belt under the Nogueira brothers. I think a black belt under the Nogueira brothers is like saying, ‘I got a free toy in my Happy Meal,’” Sonnen professed at the UFC 115 Q&A. Perhaps Sonnen should have denied ever saying it despite video evidence to the contrary. Similar to how he stated Lance Armstrong gave himself cancer, only to deny it was him in the audio clip replayed to him by sports personality Jim Rome. Although Sonnen’s distinct voice could be heard crystal clearly, the Oregonian claimed the impostor was sporting a hint of a “Hispanic” accent. “I’ve been training jiu jitsu for a long time and out of respect to Nogueira I wanted to finish this fight by a submission,” Silva said following his 7th consecutive middleweight title defense. Although Siva was thoroughly dominated and stared defeat dead in the eyes, “The Spider” came out to play at the 11th hour and flung his tangled webs around Sonnen’s neck to secure a triangle armbar submission victory. The ironic ending to their dramatic 5Round affair couldn’t have played out any better, even if Silva inked the script himself. 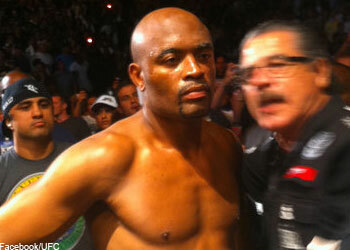 “Nogueira brothers jiu jitsu!” Silva screamed to the Oaktown audience, but it was most probably directed towards Sonnen.